I am about to live out a life dream in the upcoming week. I’m talking about a major journey I decided a long time ago that I had to take before I died. This one ranks up there with eating at a Brazilian BBQ in Brazil (checked off…and YES, it was worth it) and playing in the World Series of Beer Pong (not yet checked off). It may have come about as a hairbrained idea, similar to when my college roomate and I decided one morning to ride our bikes from Stamford, CT to Clifton, NJ (about 70+ miles) because there was a really good Chinese restaurant there, but nonetheless the idea grew into something of a legend of its own. I will be making a treck to the home of Steve Prefontaine to explore his life and career and see firsthand the kind of impact he had on his homeland. Oh yes…Eugene and Coos Bay, Oregon get ready for The Movie Mind. To be truthful…it is not exactly coming about as I had planned it in my college days, where me and my buddies who shared the same passion for the man/the legend decided we would treck up and down Pre-country in some sort of shady van (not a kid-toucher style van…more like an A-Team style pimped out ride) soaking it all in. So what if I’m going out there to attend a wedding for my wife’s friend – nonetheless…you better believe I seized the chance to tack on a few days which will be dedicated to this life journey. To be honest, I’m almost more excited because I get to experience this with someone new to the whole “Legend of Pre”. Yes, my wife thinks I am a complete freak for acting this way about a guy who I didn’t know and died some 33 years ago; but in the same sense she will feel my excitement and it will give me a chance to teach someone about why this man trancended the time and the sport of running as a whole. 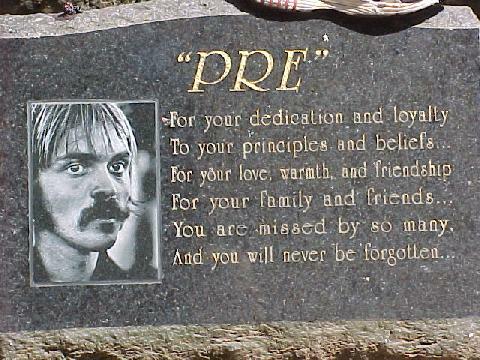 As you now know, I have had an unhealthy obsession with the life and story of Steve Prefontaine since my college days. For those of you who have never heard of him, you had better learn quick. The man who they made two feature-length films about was not only the Greatest American Distance runner of all-time, but also a sports and cultural icon. Some who witnessed firsthand his performances have said he was made of something other-worldly. Unfortunately due to his untimely demise, we never got to witness his full potential, which is a statistical anomoly considering the man set and broker over a dozen different US records and during his college career never lost a race longer than 1-mile. He wasn’t afraid of losing, but as he famously said, “you’re going to have to bleed to do it”. As for the films…they are both automatically classics, according to The Movie Mind of course, due to the story they tell. They are both in The Movie Mind’s Personal Catalogue and I strongly suggest they wind up in yours. Still, I have to say that Without Limits trumps Prefontaine. The self-titled film, starring Jared Leto also features Ed O’Neill, and while I love Al Bundy, this was too serious of a story for Ed O’Neill to be allowed anywhere near it. While Leto plays a very authentic Pre, he is outdone by Billy Crudup in Without Limits in looks and authenticity. However, the biggest difference for me lies in the portrayal of legendary Coach Bill Bowerman (also the inventor and founder of Blue Ribbon Sports, the precursor to Nike). In Prefontaine, Bowerman is played by R. Lee Ermey and while he is an amazingly talented actor, he misses on showing the true appeal and lure of Bowerman. On the flip side, the well-known Donald Sutherland does a tremendous job of turning himself into Bowerman and causing the viewers to forget about Sutherland in any other roles. This to me is the essence of capturing a still-living (at that time anyway) legend. 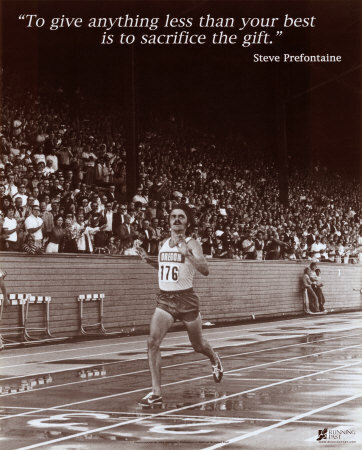 Not to be forgotten, one should certainly pick up Fire on the Track: The Steve Prefonatine Story, a documentary starring many former teammates, coaches, peers, and fans, and while no glamorous names attached, it is no less sirring and emotional than it’s glitzier Hollywood bretheren. After you have watched and studied these films and you have experienced the goose-bumps that come along with the history, you may want to veture into the local bookstore to pick up Pre: The Story of America’s Greatest Running Legend by Tom Jordan. The book provides some chilling details about his life and career and the lasting impact he had on amatuer athletics. As you can see The Movie Mind is extremely passionate about the history and dynamic impact of Pre and his lasting legacy. I will finally get to experience it up close, and because you are a loyal reader of this site, you get to come along for the ride. So make sure you are ready for a detailed recap of this amazing journey. Fear not because there will be some new reviews coming out very soon as well. In the meantime, it’s nice to pay homage to some old classics you may not yet have been able to appreciate. My google alerts led me to your blog. I work for the visitor & convention bureau in Coos Bay. Please give me a call before your trip, i think we can help make your trip here even more special. I’ll connect you with a couple folks that used to run with Pre that can take you out running on some of his old routes. We can also point you to a few places to visit that you may not have thought about. Sounds like an awesome trip! Can’t believe you’ve talked your wife on actually going!!! Just promise me one thing…….If you take the lady up on her offer, don’t attempt to keep up with the guys who actually ran with Steve!!!!! Hi Matthew, well shoot it sounds like i missed you!! i’m so disapointed, i was looking forward to meeting you and hearing about your trip. I was at a board meeting that ran long. Please email and let me know how it went. I will mail you the cd of photos i have for you, and i promise once we release that letter i mentioned, i’ll send you a copy it. I actually tried to track you down by calling the museum, then Huggins, then heard you were headed to the bookstore, missed you there too! Have a great time at the wedding. If you make it to the Pearl District in Portland, go have dinner at Andina’s and order the white wine sangria. amazing!!! I have been trying to make contact with Linda Prefontaine for a long time but have not been able to find an address or phone number. We were friends many years ago. Would it be possible to get her e-mail address or phone number from you? Good luck with your new book. Great idea that should be helpful to lots of kids.